We have the summit x3 stroller and car seat system. I bought this pram because I didn't like the way my baby's head sat in the car seat. And I'm really happy with the pram. It is good quality and fits nicely in the stroller. One thing I don't like is you have to change out the attachments for the stroller, so we can't use this and the car seat interchangeably, we have to change out the attachments on the stroller. Which to me defeats the whole reason for having the stroller & car seat in the first place. Other than that, I really like this product and I'm very happy with my purchase. Very sharp looking pram and wanted to love it. Despite the description, does NOT have the same adapters as Britax car seats any more. (They will eventually send you a replacement set, but it's a pain to keep on hand and swap out). Also, one of the release mechanisms failed, and we had to have it replaced. Not a big fan of the pad cover either-pain to wash and you can't buy additional covers. Not great sun coverage either. Between waiting on adapters and replacements, we didn't use this nearly as much as we thought we would. Can you guys please develop a sun/big cover for the pram? If you need inspiration, just copy the Britax model. That's all we need and I guarantee folks would buy it given that the oral doesn't provide enough sun coverage. A pleasure and so healthy for baby! Great pram. I love that my baby can lie flat all the time! We bought the anniversary edition color which has such a sharp look. The pram hooks on and off very easily (we have a City Mini GT). I also like the small piece of the pram cover that you can snap to stand or lie flat in order to block your baby from the elements or just to ensure more coverage. Only thing that bothers me a tad (still no regrets on this purchase though!) is that the cloth that covers the baby shifts too often. It's attached with velcro but I feel that it moves a bit too much. Other that that, it's really great! Worth the buy. Thank you!! Loved every part of the deluxe. Comfy and Spacey for baby!!! But I would like to purchase the adapters separately as I lost one and I'm about to have another baby! Can I do that?? Where .Help! Loved every part of the deluxe. Comfy and Spacey for baby!!! But I would like to purchase the adapters separately as I lost one and I'm about to have another baby! Can I do that?? Where .Help! I bought this piece as soon as it was available! WORTH EVERY PENNY!! I don't know how I lived without it before. This pram looks awesome, but I wish it came in all the colors that are available for the stroller. Will this be available in the titanium color soon? Hi! Use Deluxe Pram with City Premier, adapter indicated for model City Select. But this adapter is not fixed firmly, bassinet swinging. Can you help me to ask a questions, is it normal or this bassinet doesn't use with City Premier? Thanks! Great bassinet but attaches a bit loosely. We use the bassinet around the house for her daytime naps. When we wanted to take it out for a walk in our Summit X3, it attached a little loosely to the frame with the brackets it came with. The bassinet rocks up and down is the best way to explain it. I'm not sure where the problem is. It clicks and everything. Very happy with the stroller. But when you fold it to put i in the car you have to tak the pram off and makes it take up much more space. Great stroller that is really easy andÃ‚Â nice to push around. Very happy with the stroller. But when you fold it to put i in the car you have to tak the pram off and makes it take up much more space. Great stroller that is really easy andnice to push around. This is a great item but I ordered it accidentally. I have the double city mini gt and unfortunately, it was not compatible. This bassinet is wonderful. It looks so sleek on the city mini gt, I always get compliments on it from people on the street. It is so easy to take on/off & has the same attachment as Britax carseats so we don't have to change out the adapter. It is very roomy and comfortable. We brought it to the beach and he slept in there under the umbrella without any problems! It's an expensive addition to the stroller, but we couldn't be happier. Luxurious and a great addition for the Citi Mini Gt especially for my newborn. It is lightweight and easy to install. The mesh opening in the back is great for your little one to explore the world while protected. Only problem is that Baby Jogger doesn't make a rain cover for this so while it has great sun protection it is no good on a rainy day. 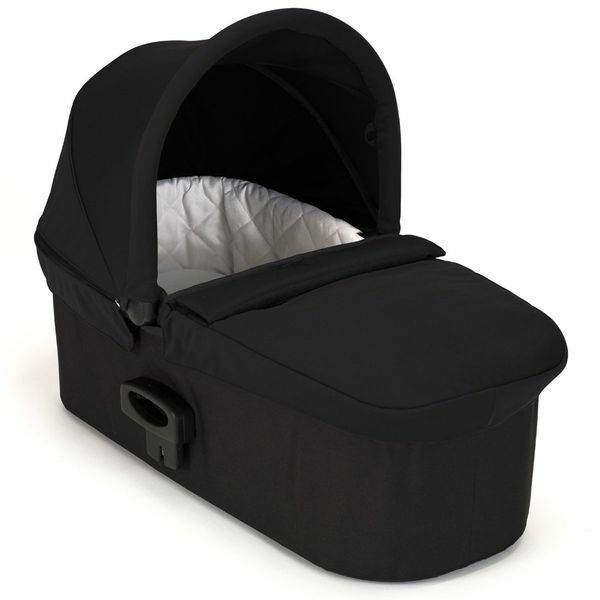 This is a gorgeous bassinet, and I can compare it to others I've seen such as the City Select bassinet in teal. I bought this in teal to compare it to the one that comes with the City Select and it is so much larger and nicer. I'm surprised Baby Jogger says it isn't compatible with the City Select, because it fits on mine and allows the second seat to sit rear facing on the bottom. Although there isn't much of a view for the child on the bottom seat, it still allows the Select to be a double stroller and provides so much more room for your infant! I love the mesh opening in back to allow a breeze through and the pad is very soft for baby...much nicer than the thin piece of foam in the Select bassinet! The Deluxe Pram offers your newborn a soft and comfortable spot to rest with a luxurious quilted interior, a large vented sun canopy with a UV 50+ rating, a pop out sun visor and wind guard to protect baby from the elements. The plush mattress pad has a machine washable cover and stays cool in summer months with an air vent in the base of the pram to increase air flow. Includes the adapters needed to attach to the stroller.